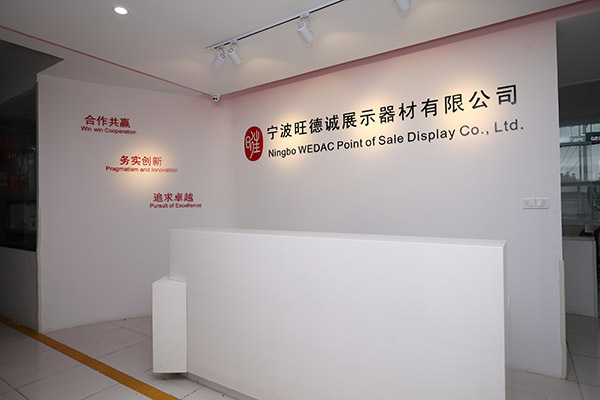 Ningbo WEDAC Rubha Sale Taisbeanadh Co., Ltd. 'S e neach-saothrachaidh ann an dealbhadh gu sònraichte, a' leasachadh agus a 'cruthachadh stòr-reic uidheam a thaisbeanadh airson diofar sheòrsaichean de sgìrean gabhail a-steach maise, cùram-slàinte andE-thoitean gnìomhachasan. Suidhichte ann Ningbo Zhejiang na Móir-roinne, tha sinn faisg air a 'ainmeil uisge-domhainn port-Beilun port, a' faighinn buannachd bho a goireasach lìonra còmhdhail. Ag amas aig a 'toirt aon-stad an t-seirbheis de thaisbeanadh uidheam, tha sinn a' mhòr-chuid a 'cuimseachadh air dealbhadh agus leasachadh. Stuthan againn a 'còmhdach raon farsaing gabhail a-steach reic stòr sgeilp Pusher & sgaradh an taisbeanadh siostam, POP / pòs siostam, mhaise taisbeanadh, mòr-bhùth / bùth taisbeanadh caibineat / Sgeilp / bhogsa, acrylic taisbeanadh, LED a thaisbeanadh, soidhnichean, mòr-bhùth DIY taisbeanadh aonadan & fuasglaidhean etc. Cuideachd pròiseasan againn anns an sgìre seo gabhail a-steach acrylic saothrachadh, obair-mheatailt (CNC lùb, punching, leusair gearradh), plastaig stealladh agus obair fiodha. Aig an aon àm, tha sinn aon de na proifeiseanta acrylic bathar-saothrachaidh ann an Sìona. Às dèidh a 'phoileasaidh càileachd an toiseach, ar innleadairean aig a bheil an eòlas san raon seo airson còrr is 10 bliadhna air a stèidheachadh agus a chur an gnìomh teann siostam stiùireadh càileachd a thuilleadh air cur a-steach sònraichte artcraft a shàsachadh iarrtasan sònraichte. Bhith a 'cumail a' ghnìomhachais a feallsanachd co-obrachadh chom-win, pragmatachas agus ùr-ghnàthachadh agus a bhith an tòir air sàr-mhathais, WEDAC seachad a 'toirt seachad proifeiseanta dealbhadh, àrd-inbhe agus bathar smaoinich seirbheis. Thairis air an 10 bliadhna, na stuthan againn air a bhith a-null a dh'Astràilia, Iapan, na Stàitean Aonaichte agus dùthchannan Eòrpach agus tha sinn air a thaghadh mòran phròiseactan airson thall-thairis luchd-dèiligidh bho dhiofar sgìrean. WEDAC miannachadh a bhith a 'stèidheachadh Com-pàirtichean dàimh le luchd-cleachdaidh an dà chuid aig an taigh agus thall thairis, agus an co-bhonn a chruthachadh mòr adhbhar.